Cork Fabric £11.95 is backed with natural-coloured soft woven fabric, and is great for stitching. You can make bags, wallets and more - the possibilities are endless. There is no need to line the fabric for bags etc, as the reverse is very decorative. It is even suitable for gentle hand-washing! 0.8mm thick. You'll find lots of bag patterns available on the internet. We've made up So Sew Easy's free Cosmetic Bag pattern, which you can download for free. 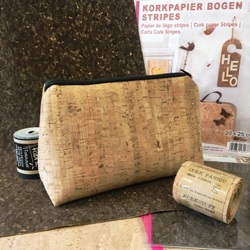 It is the perfect size for one sheet of cork fabric!